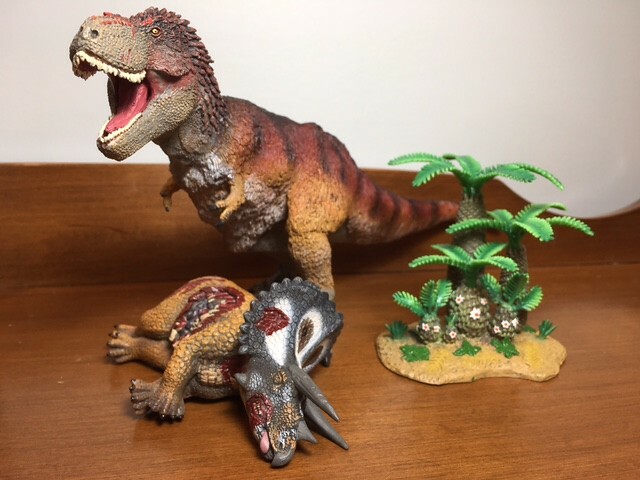 What's with the animosity against Collecta's Feathered T-Rex all of a sudden? It's a great figure! Mosasaurs are more lizard-like than whale-like overall. Skin impressions show mosasaurs were covered in scales, and they have every reason to have a forked tongue, and... mosasaurs are lizards. Mosasaurs were completely aquatic and retained all four of their limbs, while in whale evolution as they became completely aquatic their hindlimbs became vestigial and eventually disappeared. And the tail flukes of mosasaurs are vertical while those of whales are horizontal. I don't understand it either. One of the negative aspects of human nature, I guess. As I said last night, this new one may end up in the same league as the CollectA Deluxe, but it will certainly not replace it as my favourite. Actually, could this "new" mosasaur actually be a repaint of the carnegie one? I could be horribly wrong, but i can see some similarities between the two. Why on Earth would Safari repaint a 10 year old toy that's no longer accurate? Finally, I can add a feathered rex to my collection ! The detailing does look a lot better as well, as others have stated earlier in this thread. I'm eagerly Looking forward to getting my hands on it. The Mosasaur looks great too, slightly reminiscent of their earlier Tylosaurus. Well they did repaint their older WS mammals line (amebelodon, doedicurius...), so i wouldn't be surprised if they went ahead and repainted the carnegie one, then again i could be wrong. Are you talking about the Carnegie Mosaurus or the Tylosaurus? Carnegie tylosaurus, sorry i wasn't being specific when saying "mosasaur"
the feathered CollectA rex and the new Safari one would look awesome together. I guess a repaint would be more economical than a new figure from scratch. I've never been a big fan of it, purely based on photos I've seen, my thoughts on getting it have mainly been just because it's the most feathered rex toy around, but I would only customise it to fix my personal problems with it anyway. The colours are probably the biggest issue, but I also really dislike the design of the head, and the way the feathers just stop, it just looks kind of awkward, exaggerated by the large size of the scales on the face. For me, this safari one looks much more consistent... it probably won't be perfect, but it certainly looks more 'fluidly' designed than the collectA. I'll probably get the CollectA to customise, but sometimes I just want to pay for a figure that I don't feel the need to alter myself. To my admittedly untrained eye, the mosasaur looks a bit too slender to be Mosasaurus proper. I'm betting on a smaller mosasaur like Clidastes or maybe Platecarpus. Definitely doesn't look like a repaint of an existing sculpt. It's not a repainted Carnegie Tylosaurus. The mouth on that new toy is opened much wider. On that note, let's do the same thing we did last fall before we knew the identity of the Plesiosuchus last year. What mosasaur do you think this is? Mosasaurus itself? Platecarpus? Prognathodon? I think the mosasaur will be either a Mosasaurus or a Tylosaurus ,though another species would be interesting.As for the azdarchid,I'm pretty positive it is a Quetzalcoatlus .And the theropod is definetely a Tyrannosaurus . Though I must say,an up to date dromeosaur would be great. That is the vainest Dragon I've ever seen. FAAAabulous is more like it. it already looks a heck of a lot better then their previous dime store squeak toy of a mosasaur! Im really excited for 2017! Finally a new Safari quetzal, mosasaur and a great looking feathered Rex! as an animal figure lover: I see boobies! a kookaburra! always love more birds! as a fantasy figure collector: more ugly pastel dragons! yay!? a Hobbit? hoping for a sphinx this year! Well, as long as we're speculating, I'm gonna throw in a wild card: maybe the azhdarchid is Zhejiangopterus, which if I remember correctly is the most completely known member of the family. I think I recall Mr. Watson saying he doesn't like to do sculpts based on fragmentary remains. I think the rex is still a rex, but I don't think it's as big as the photo makes it seem. I think they photoshopped everything to make it appear to be in scale. What mosasaur do you think this is? Mosasaurus itself? Platecarpus? Prognathodon? As much as I would love if Safari made a Prognathodon, this looks way too gracile for that. I think it's a tylosaurine of some sort, most likely Tylosaurus itself (although, it would be awesome if this is Taniwhasaurus instead! ).